We are seeking large and small donations from private donors as well as corporate sponsors. Our goal is to raise $72,000 for preservation costs. Using their 501c(3) status, The Schwenkfelder Church will be managing the funds for this project. By doing so, the church relieves us of the cost of creating our own 501c(3), ensuring every dollar goes toward preservation! 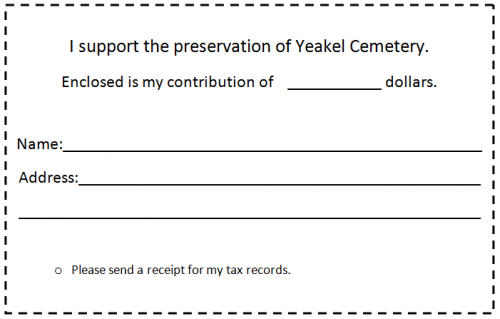 Checks should be made out to: The Schwenkfelder Church memo: Yeakel Cemetery Fund. You can print out this handy form to send with your donation. follow the instructions to complete the transaction. A receipt will automatically be sent for your records.